In service since the early 1960s the basic 432 armoured personnel carrier is NBC proof and when necessary can be converted for swimming when it has a water speed of 6 km/h (if required). Properly maintained it is a rugged and reliable vehicle with a good cross-country performance. In July 2006 the UK Mod announced the provision, for Iraq, of around 70 uparmoured and upgraded FV430 troop carriers (Bulldog), in addition to the 54 already on contract. Deliveries started in late 2006. In the longer term the MoD expects 900 vehicles to be upgraded to the Bulldog specification and the programme should be complete by mid 2011. For counter-insurgency operations the up-armoured FV430 provides a similar level of protection to Warrior and the vehicle will is able to carry out many of the same tasks, thereby relieving the pressure on heavily committed Warrior vehicles in armoured infantry battlegroups. 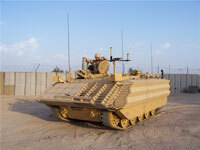 Approx 1,100 in service as Command Vehicles, Ambulances, and 81mm mortar carriers. 750 are base line vehicles.